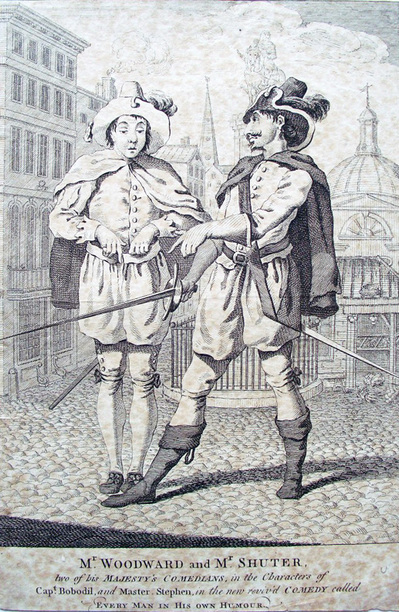 Unknown artist, Mr. Woodward and Mr. Shuter, Two of His Majesty’s Comedians, in the Characters of Capt. Bobadil, and Master Stephen, in the New Reviv’d Comedy Called Every Man in His Own Humour, ca. 1752. Etching and engraving. Graphic Arts Collection British Prints GC106. During London’s 1751-52 theater season, a revival of Ben Jonson’s renaissance comedy, Every Man In His Humour, was performed at the Theatre-Royal in Drury Lane. The role of Captain Bobadil was played by Henry Woodward (1714-1777). Just over twenty years earlier, Woodward had received his first recognition a few blocks away playing Ben Budge in John Gay’s The Beggar’s Opera. Specializing in comedy and the character of the Harlequin in particular, Woodward’s stature grew to include leading roles in theaters throughout London. During the 1747-48 season, Thomas Sheridan invited Woodward to perform at the Smock Alley Theatre in Dublin, after which the actor join David Garrick’s company at Drury Lane. At the age of 34, his Romeo was declared a masterpiece of acting.